The sloped sides of a skillet lets food slide out easily, and the non-stick surface makes clean-up effortless. Use the larger pan for your family weekday meals or for weekend entertaining. Use the smaller skillet for a tasty BLT or to make nutty browned butter to top your seared tuna fillet. There's a reason why Anolon is the Gourmet Authority - we take the time to make quality, precision cookware that creates the perfect balance between functional beauty and the durability you need for everyday cooking. Twice as hard as stainless steel and metal utensil safe, the hard-anodised construction of these Anolon Endurance+ skillets provides exceptional heat conductivity and distribution. 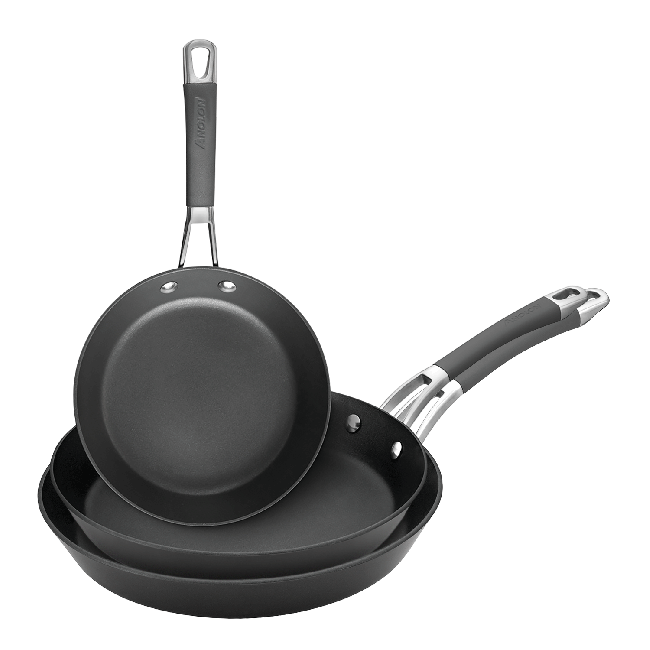 DuPont Autograph® non-stick provides maximum food release and is easy to clean. Riveted handles for strength and durability, with SureGrip™ for ultimate comfort. Suitable for all cooktops including induction. Oven safe to 200°C. Anolon Endurance+ Skillet Triple Pack is rated 5.0 out of 5 by 3. Rated 5 out of 5 by Pania04 from Love it! I bought this around a month ago and use them daily! Rated 5 out of 5 by Toj66 from Use & clean the skillet set They heat up so evenly & are just SO EASY to clean!!! Love them! Rated 5 out of 5 by Karina2 from Even heat distribution Love the non stick surface! easy to clean and heats evenly and quickly. Browns the meat without any fats. Egg slides right out no sticking and the pans rinse off easily.